Sprouting is Fun and Easy!!! I used to be intimidated by making my own sprouts… now it is a serious addiction. I read this awesome book over the winter called Indoor Gardening: Seed to Salad in Seven Days by Peter Burke. 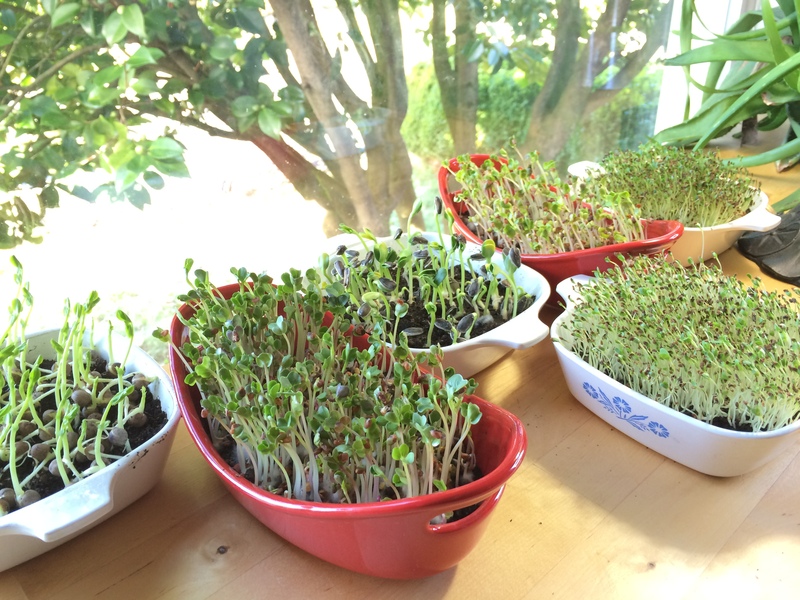 It makes sprouting super fun and easy! I used to sprout in a mason jar and sometimes my sprouts would smell strange or start to look like I really shouldn’t eat them. Then I read the Indoor Gardening Book and it made so much sense. Now I sprout in potting soil with kelp flakes at the bottom, cover with wet newspaper for 4 days (leave them in the cupboard to do their magical sprouting) and then let them hang out near a window to grow and green up for 3-5 days and I have beautiful, delicious sprouts! I just cut them fresh as I want to eat them or add to smoothies. The best part is that when I am done I have a super nutrient rich soil and nitrogen block to add to my compost bin or mix directly into my garden soil. It is a win win situation… it feeds me, my garden, cleans the indoor air and really adds to the feng shui in my home. I really like Peter’s book because he makes sprouting really user friendly and he breaks it down to be super simple. He has trouble-shooting guides and even recommendations for the types of sprouts that work the best. Pictured above are peas, daikon radish, sunflower, alfalfa, and kale sprouts! I usually start 2 pots every other day so I have a constant supply going. Sprouts are so good for you and have all the nutrients of the adult plant jam packed into the tiny one you are about to harvest… how awesome!!! They are a great food especially over the winter and spring since that is what nature is getting ready to do anyway! I love them and I hope you do too! ← What does Vegan Acupuncture mean anyway? What a great idea. I have to try this.